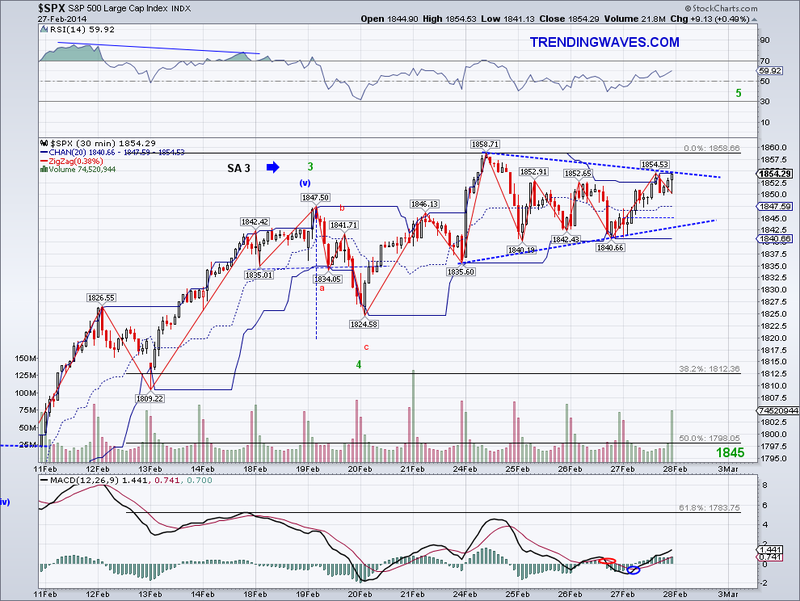 The market broke out of the triangle and put in an all time high today as I had speculated on yesterday's post. However, there was a strong intraday reversal due to the situation in Ukraine but the market managed to reverse loses towards the end of the session and close at an all time high. Looking at this technically, the wave could be a 1-2 either way so I'll wait until Monday before putting some labels on it. The market has been ignoring somewhat bad economic news lately but the situation in Ukraine is serious as Russians look determined to secure the Russian speaking region of Ukraine as I think there is a historical significance to them. That and the fact Russia would not welcome a pro west country in their backyard, so this could turn into a conflict in a short period of time. I didn't commit to any new positions today and probably will avoid the market until there's more clarity. 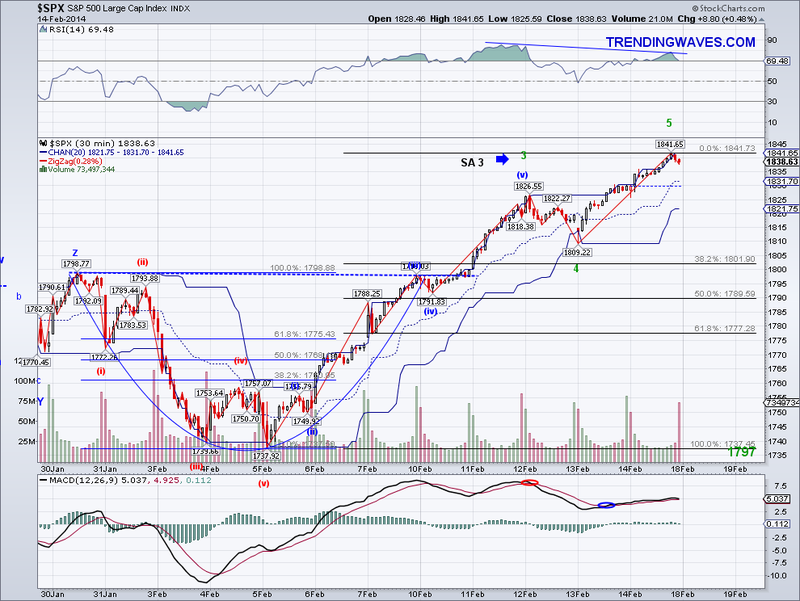 The trend is clearly up and without the Russian situation the market should make higher highs. But Putin doesn't screw around so we'll have to see what Obama's and Europe's response will be. We got more of the same today with prices staying within a triangle. 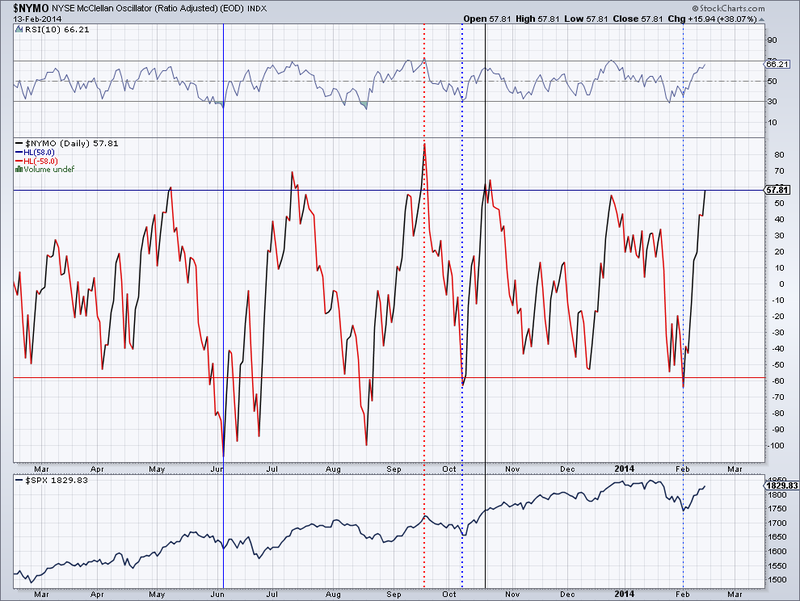 However, short term oscillators have been reset and the bias is up. Also, I drew a trendline for a triangle containing today's price movements however one could argue today's wave broke out of a tighter triangle so chances any more upside outside the upper trend will result in an all time high. 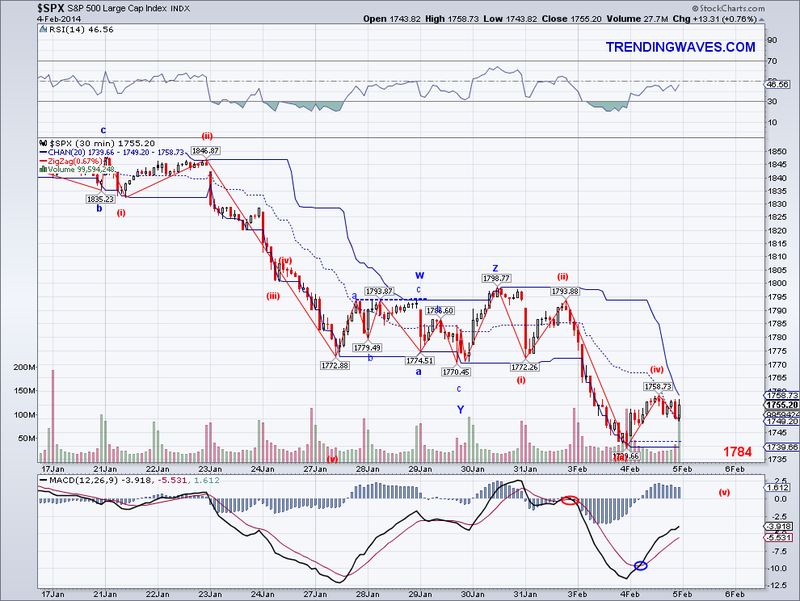 If resistance is broken I will get back in long if I see a tradeable set up. I did however buy more China related shares on my long term portfolio and will probably add some more early next week. The market has been correcting sideways since putting in an all time high but since that impulse (to 1858) was basically 3 waves it makes the chart look somewhat odd since there is an obvious triangle taking shape as well as a Head and Shoulders targeting 1820. Usually, we get triangles and H&S formations after a stronger W3 but this one comes from what looks like an ABC as opposed to a 5 wave count. 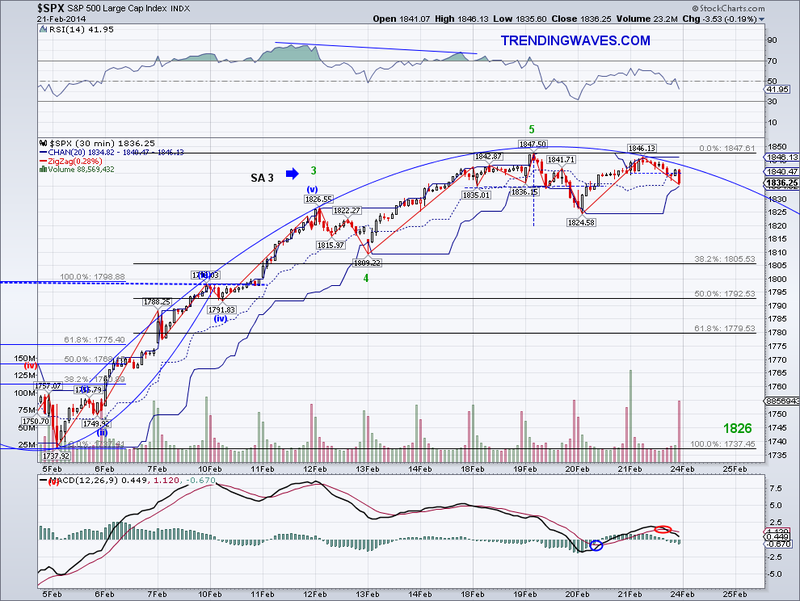 And who know, perhaps we will just see 3 waves as an impulse to another high and then see a bigger correction? 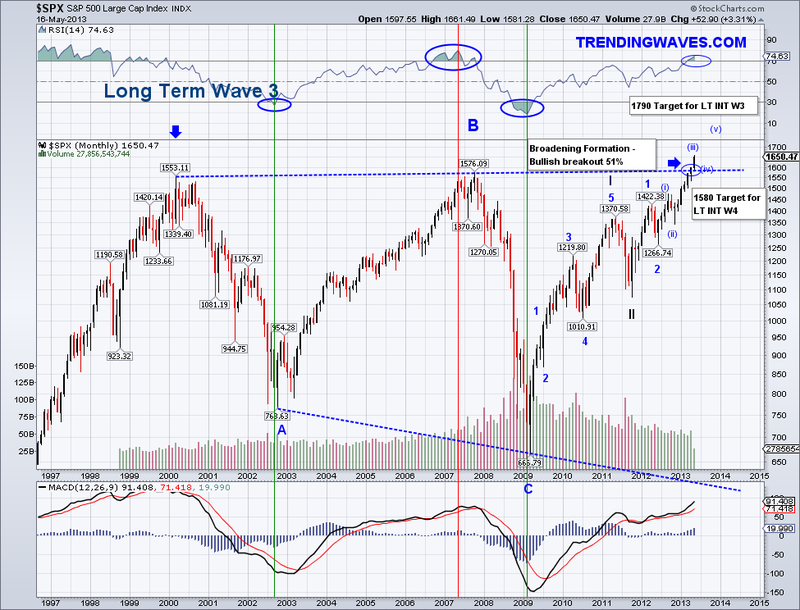 this obviously goes against orthodox Elliott Wave rules but that's what's in front of us. It's rare to see something like this so this is something we can learn from. With that said, a nested 1-2 is still a possibility, it just looks off as far as form. I ended selling the two long positions profitably in the morning (18/21) and I am waiting for some clarity before committing again. VXX btw has been rising (ironically from the minute I sold it when an all time high was made) and it usually does that when there is some sort of top, so we'll see how this works out as a to predictor. 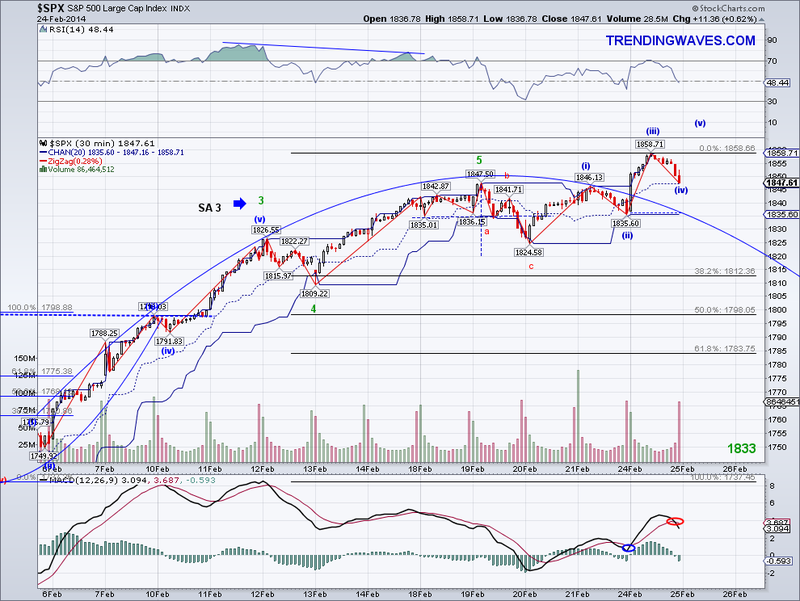 The micro 5 count I was tracking was invalidated today because of the W4>W1 rule. 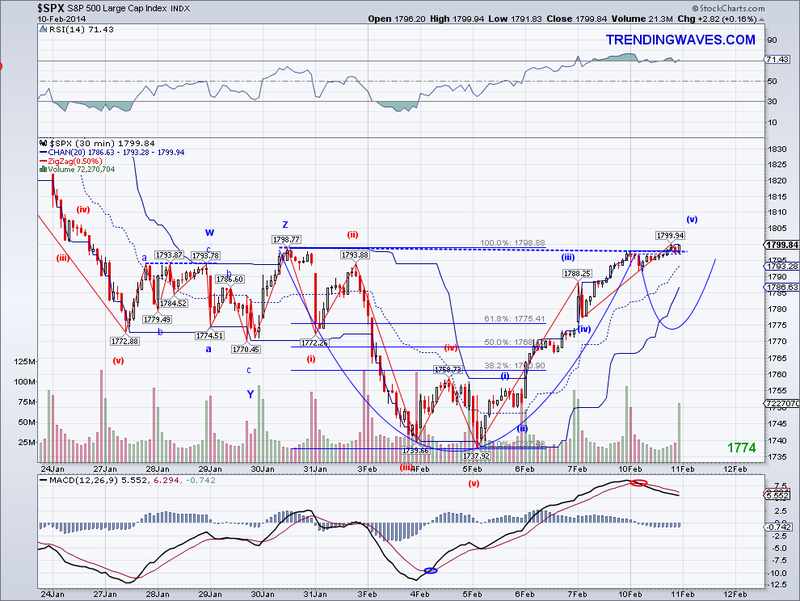 So I am looking at it now as a bullish nested 1-2 with a new high to come in the next session or two. Perhaps the market will end up repeating what it has done in the last 2 years, which is rally from January until April and start selling off in May? So far there are couple of quick corrections from the 1737 bottom which look more like W4s than W2s and should this rally continue without a proper Fib retracement, I will just assume there won't be a "normal" W2 as it will be one of those Stand Alone W3's which tend to look like Zweig Breath Trusts. I bought more short term longs today so I am all long now in my short term portfolio. Hope there will be a bullish W3 tomorrow.. The market was able to break out of the rounded top trendline and take out the all time high after hesitating for over a week. I was expecting an all time high and I continue to expect higher highs but this move up without a deeper correction was somewhat of a surprise for me. Fundamentally and technically speaking the market should have corrected more but the trends were clear last week so they are again right in pointing the direction of the market. I see a possible 5 wave count to 1875 but the selling at the end of the day has the chance of invalidating the bullish count posted so we'll have to keep an eye and see if we get complete reversal or a bullish nested 1-2. I stopped out at the break of 1851 at a loss (16/19). This position was profitable when the TA was tested last week (my target to lock in $) but since I wasn't awake to sell I now have to absorb the losses. 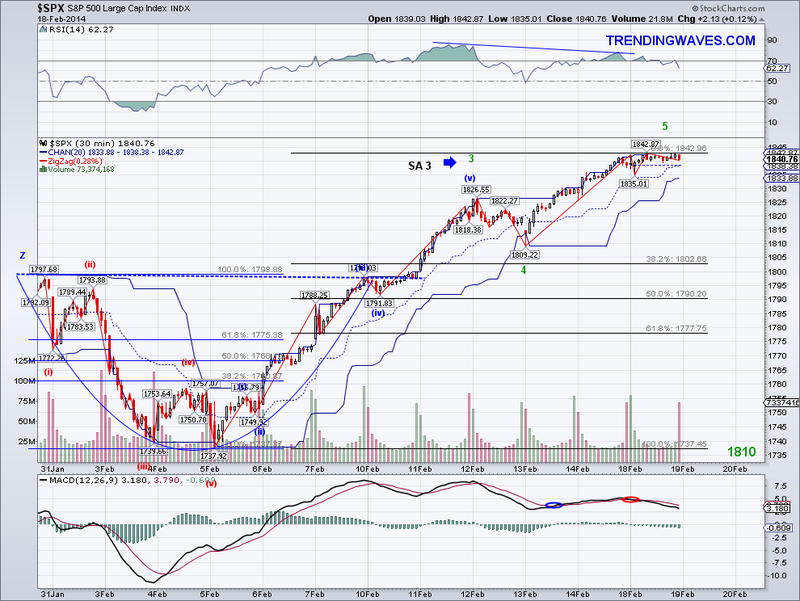 At least I noticed that TD Ameritrade has reinstated trade triggers so I am hoping this won't happen again.. I am keeping my short term longs obviously and I am planning to add to my long term portfolio this or next week as I have some money coming in. If I see 5 clear waves up then I'll consider getting back VXX but for now I am not going to get in the way of a blind bull. The market continued its sell off overnight but by the time the market opened it had recovered almost 10 points from its pre-market low and then continued to rally towards the end of the day. The move on the cash market looks like an ABC that bottomed exactly at the micro Head and Shoulder's target of 1824 and the Trend Average was tested in pre-market but not in the cash market. So the options I am looking at are either a complex correction with another wave of selling to test the rising 50 DMA or another bullish leg that will break the all time high. I am still not all that convinced with the last two minor corrections being enough for a base for the market to mount a sustainable rally and ideally we would get a deeper correction before a stronger bullish wave. But obviously I will not be fighting the trend, specially now that it's all green. Now my trading.. I was hoping to lock in profits at any opening below yesterday's close and with the way futures down a decent amount it looked like a done deal. But futures started to reverse early morning and unfortunately I was asleep when the market hit the H&S target. So now I am stuck with VXX and hoping we will get a complex correction. If the market makes an all time high then I will stop out at a loss.. TD Ameritrade stopped providing trigger alerts and I wish there was some sort of service that would actually give me a call to wake me up! if anybody knows of anything like this please let me know, I am sure I'm not the only one in the west coast that could use this service. The market broke out of the triangle I mentioned yesterday to test the all time high but it finally put in a long overdue top today and now the question is whether the 50 day moving average/trend avg will be tested as I have been expecting. A successful test of the 1815 area would set the market up for a proper looking Inverse Head and Shoulders that targets 1963 so we'll see how the market handles that key level. I see an ABC move from the 1847 high so far but if that turns into a 5 wave count then it targets the 1815 area or today's trend average. 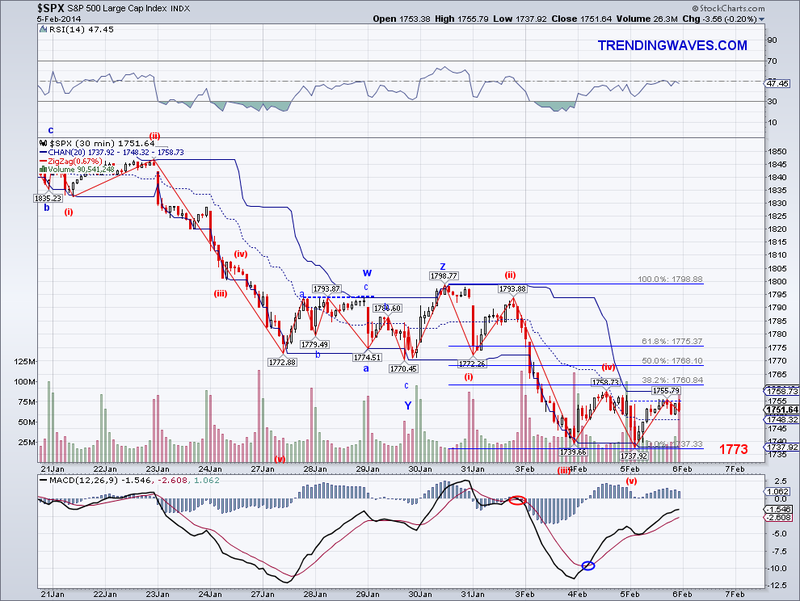 Also, there is a micro Head and Shoulders that targets 1824 so the chart patterns favor mode downside. One thing however to keep in mind is that the correction to 1737 was not long enough in time to call it an Int LT W4 so I am keeping in mind the possibility of a Flat being put in that will essentially test 1737 again before rallying. The key to all of this is the 50 DMA, it has to hold for the market to continue to go up. Lastly, the China PMI was just announced at 48.3 which will be plastered over the news. The correction last month started when the China PMI came in at 49.5, so if the market's intention was to sell off then this can be used as an excuse. Never mind that China has been rallying and actually continues to rally after tonight's "bad" news, this is not about China but about finding a reason for make bag holders out of blindly optimistic bulls. I had a choice to sell VXX for a profit at the close but decided to hedge my short position instead by buying back GXC (China ETF). So we'll see if the market sells off in a W3 or starts to bounce tomorrow. The market put in a marginally new high today thanks mainly to the NASDAQ, however, I think the market is close to topping. Technically speaking there could be a triangle that could break out and challenge the all time high at 1850 but it will have to first break out of the 1843 resistance level. I can't imagine people buying at these levels without a good correction, so I am still looking for a proper Fib retracement and a test of the Trend Avg/50 DMA. I am maintaining my VXX and will be back to my long position in the next few sessions. Also, unless there is some bearish miracle tomorrow, the Intermediate Trend should be turning bullish tomorrow so that's just another indication that we will most likely see an all time high fairly soon (hopefully after a correction so I can sell my VXX and get back long!). Another day, another rally. What started as an expected counter rally has turned into a relentless rally led by tech, which implies a risk on attitude. The reasons that started the sell off few weeks ago where really a non-issue (China's PMI, emerging markets) but at the same time the market has reached a bullish extreme and it is very short term overbought. 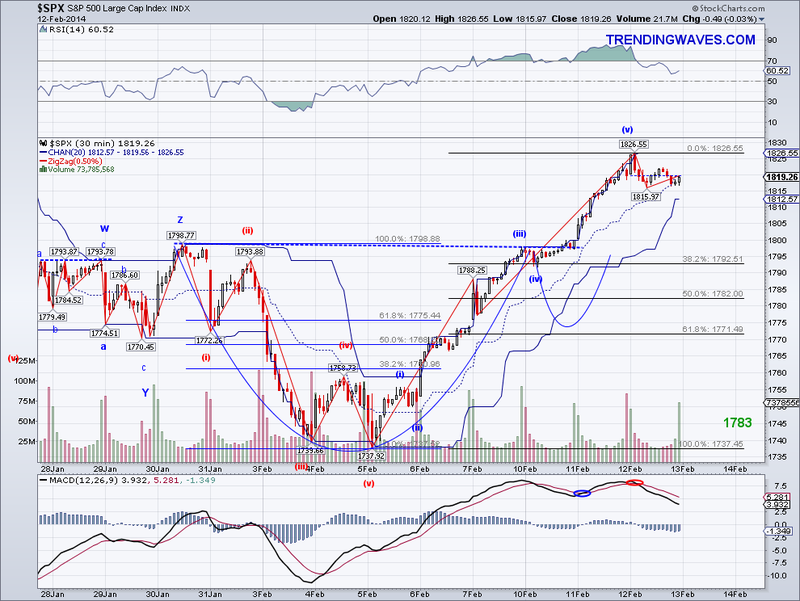 With today's rally we now have a neckline for an IHS that targets 1963 if the pattern completes. Coincidentally, I was doing some calculations on the 5 waves to 1826 and if I were to count that waves as a W1 then we would have a target of 1960-80. However, I still believe we are on the 5th wave from the structure from 1737 because of the NYMO chart and I expect (and hope) the 50 DMA/TA will be tested on the correction. And btw I wasn't expecting the 50 DMA to get tested immediately, I meant to say the 50 DMA will be tested once the entire structure completes which could be today or early next week. 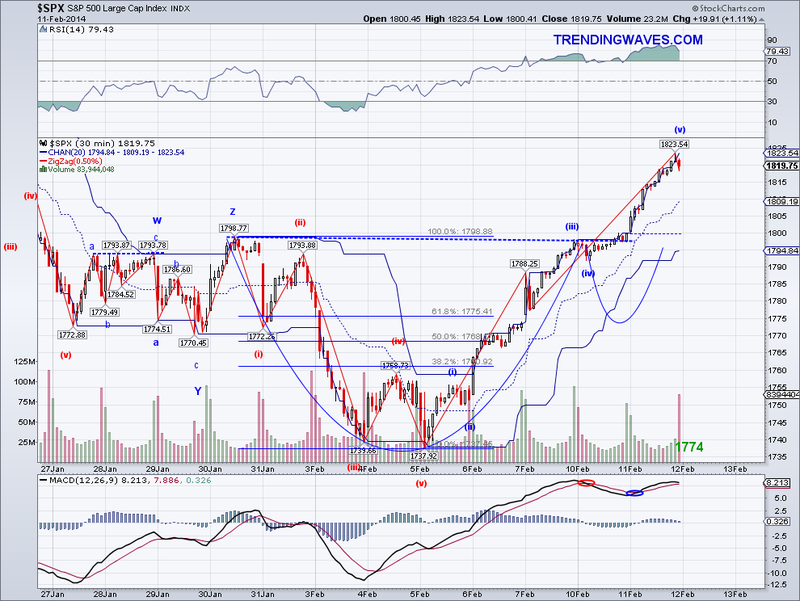 There is resistance at 1843 and after that it will be the all time high at 1850. I ended up selling my short term longs to position trade around 1840 and I'm still holding VXX, so I am technically 100% short now on my short term portfolio. I figured the market will be running out of 5th wave suckers early next week. Correction to 50 DMA again? The market finally gapped down for a change today only to test the 50 DMA and rally again to put in another high for this wave. I was focusing on the W4 triangle yesterday but I should have added the possible ABC move to the 50 DMA, which is what happened in the morning. 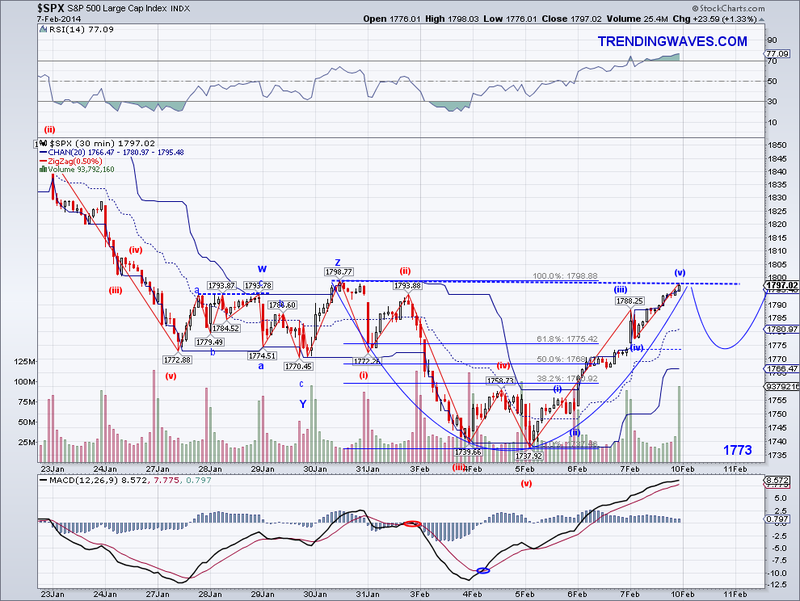 Now that we have this ABC move from what I consider an SA3 top, I am more confident the rally today is the 5th wave. One could make the argument that the ABC today was for a W2 but I think chances of that are slim as I think there needs to be a deeper correction first. If you look at the NYMO chart I posted, you can see there hasn't been a rally like this in at least a year as the index went from the red line (oversold) to the blue one (overbought) without much of a break. Once the market finds a top, I will be watching the 50 DMA again as a target for a neckline of an Head and Shoulders, given the fact that people and computers bought at that level today I suspect they will do it again on the coming correction. I got lucky today in that I actually woke up around 6:30 am and when checking the market I noticed the market had not been able to gap down below the 50 DMA, so I sold the VXX I had to position trade at the very bottom and then bought it bought towards the end of the day 3% cheaper, so not that much underwater anymore. 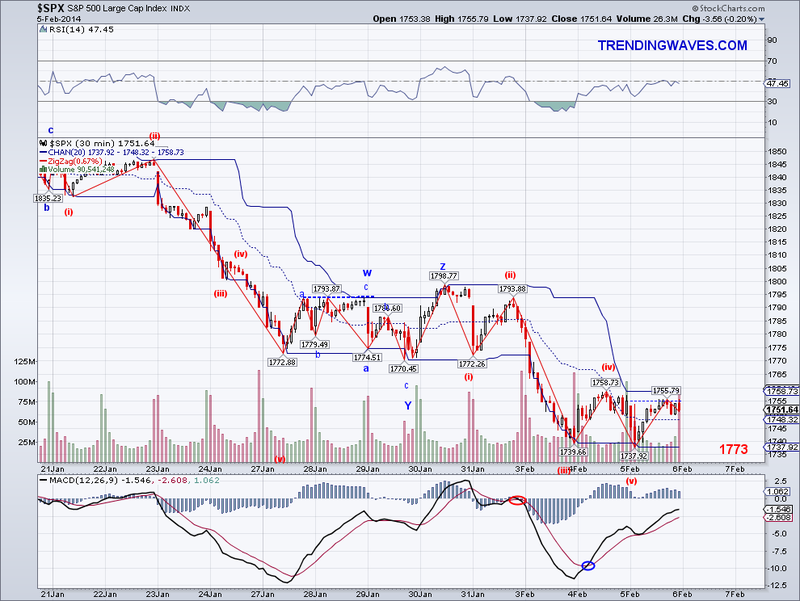 If the market does what I think it will do, I will be doing the same exact trade. The market finally took a break today after adding a higher high to the 5 count and the intraday reversal is either a W4 or the beginning of a deeper correction. I see a triangle in the micro count which would fit the W4 scenario, so unless the market breaks today's low tomorrow then there might be some more upside left. There is resistance in the 1830-32 area and if that breaks then we will most likely see the market form a neckline for one huge Inverse Head and Shoulders in the 1840-1850 level. I'd like to see the market start a real correction asap as I'd like to make money from my underwater VXX position sooner rather than later. But if we do go higher then I'll sell some of my longs and buy them later at a better price. The market continued its relentless rally today and it is getting to the point where the waves are about to exhaust, the chart looks as if a rocket took off. 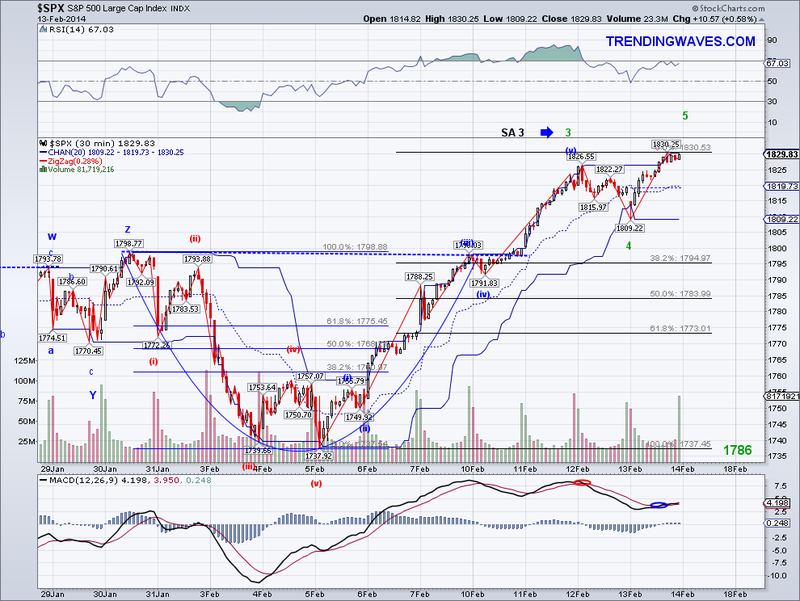 If anyone was doubting the wave from 1737 was not impulsive, I think today clears that up. The best we can do now is shuffle the labels a bit and assume 1792 was the actual (IV). The micro count I mentioned yesterday with a target of 1804 was not the final 5th as I had assumed but rather W1 of what I think is the final 5th. 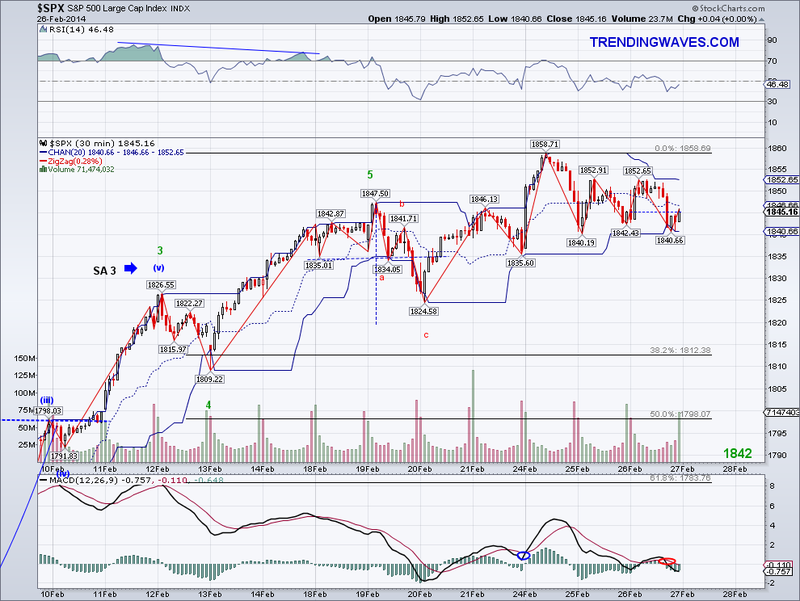 If we go by what the cash market printed, the target for the 5th should be in the 1820's. However, if I count pre-market prices then the target is actually higher as this W1 topped at a higher price and the projection would be in the 1830's. Whatever the case, I am planning to trade mostly long now as unless there is some sort of bearish miracle or another manufactured crisis, the index is probably going for the all time high after a correction (timewise or pricewise). I ended buying VXX as planned but since I was wrong in my presumption of the final 5th, I bought it way too early in the low 1800's. However, I did good on my position trade on my longs and if the market decides to go for the 1830's, I'll probably position trade again and hold a net short (VXX) position. I will be selling VXX hopefully at a profit on the pullback to either the Trend Average or the 50 DMA, which I suspect will have many people jumping in. The market refused to pullback much today and instead it continued its march towards the 1800's. Seems as if recent worries have all dissipated and I even see "experts" who were calling for a major correction on the news last week capitulating today. But the potential scenarios remain the same and the key to what will happen next will be the pullback to the 1768-1772 support level. I ended up selling VXX today for a negligible profit (16/18) when I saw the triangle on the micro count forming but I will be buying it back hopefully at the next resistance level which is 1808-1813. One thing I did notice is the 5 micro count from the 1792 low has a target of 1804-07 so I guess I might jump in a bit earlier tomorrow just in case (assuming the high is not made in pre-market) as it would be a nice ride if the market reversed to 1770. Last but not least the Trend Average has turned bullish so the IHS might just come to fruition, specially now that some people are noticing the emerging market panic was about nothing. As an example I am posting an article from CNBC (which is one of the main culprits for misinforming the public), where the author wonders why China wasn't falling. He forgot to mention or notice that the SSEC did not react to the PMI announcement at all, which is the main excuse markets started to sell off in the first place. In fact, the SSEC had been rallying and after consolidating for a few sessions it rallied 2% yesterday. So without the emerging markets worry in the background, the index might just be able to turn things around and postpone a bigger correction again. The jobs report moved the markets as I had been expecting but I was wrong on getting a good report based on the ISM. The numbers came way below expectations but the markets rallied as if the report had actually surprised to the upside. It goes to show the market does what it wants to do at times and news have nothing to do with it. 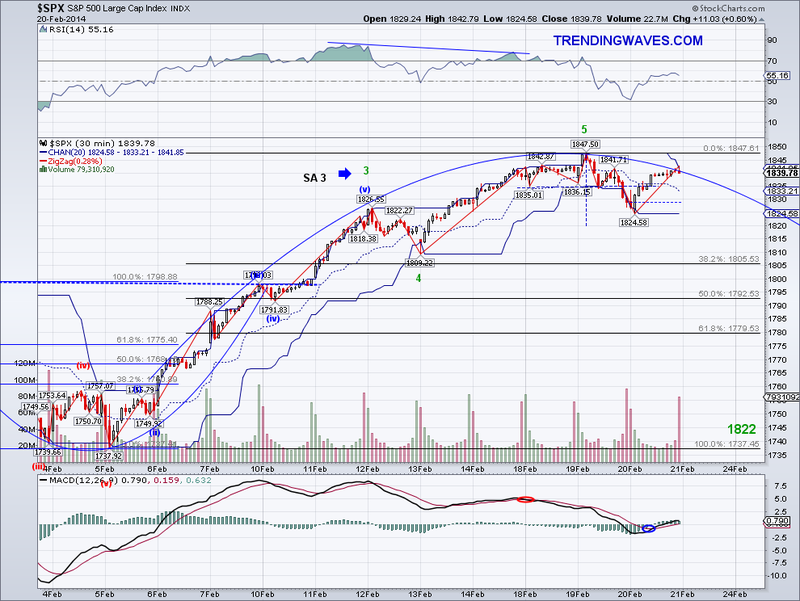 The close was very bullish and I see a 5 count complete from 1737 based on my original "normal wave" projections. However, one could argue the top today was just the W3 with more upside to come after a correction that will likely challenge the 50 DMA at 1809. Also, the market could be setting up an Inverse Head and Shoulders or a Cup and Handle (take your pick) that targets an all time high at 1858. So early next week we have to watch how the market corrects, if the market hesitates with downside and finds support before 1768-72 then we will have a very bullish pattern and mostly likely the Int Trend will reverse to the bullish side. As it is the Trend Average turned neutral today and will go positive if the market fails to close under it in the next session or two. 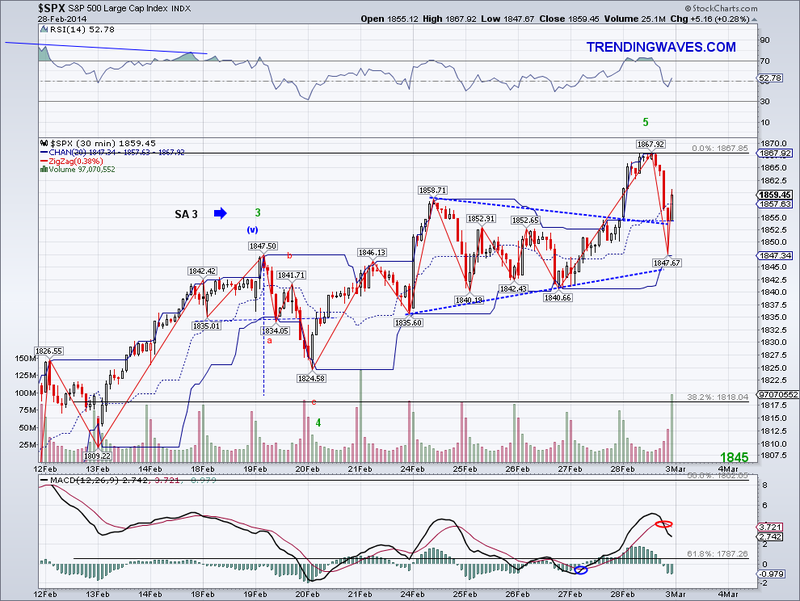 With that said, the Int Trend remains firmly negative and in the ideal world this completed wave is just the X wave and we will get another ABC to test the 200 DMA. Also, from the "look" perspective, the LT Int W4 should go on for a few months not just a few weeks as all the bullishness needs to be worked out to have a good solid base to rally from. I ended up buying VXX at resistance so I am hoping for a decent correction starting Monday or Tuesday but I'll be ready to jump ship at a moment's notice as this thing could drop 10% in a blink of an eye (just as it did in the last 3 days). The market rallied as I had been expecting and spent most of the day battling the resistance level I mentioned last night. But at EOD the Trend Average was tested and the index was able to pull slightly out of resistance range and close over the Trend Average, so there is a slight advantage towards the bulls. 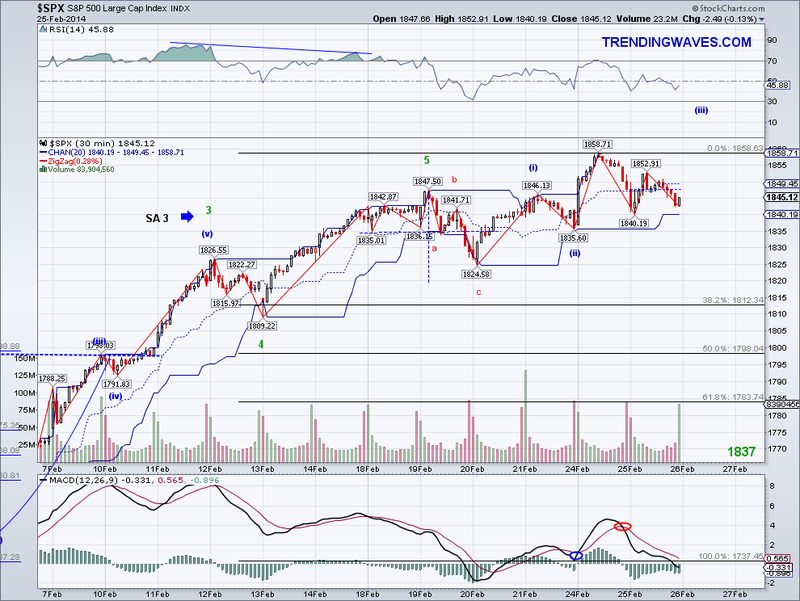 However, the bounce from 1737 can still just be an ABC and not a bullish 5 wave count so tomorrow we will find out. I am assuming the jobs reports tomorrow will be the excuse to move the markets and if the ISM report is of any indication, probabilities are we will get a good report. If this is a bullish 5 count we should see 1780+ tomorrow, at the same time if 1755 gets breached the count is invalidated and I will assume the 1737 level will be tested. I ended up selling XIV (15/17) at resistance as I didn't to risk my profit and I will be looking at upper resistance at 1786-93 to buy VXX or support at 1755-58 to buy back XIV. 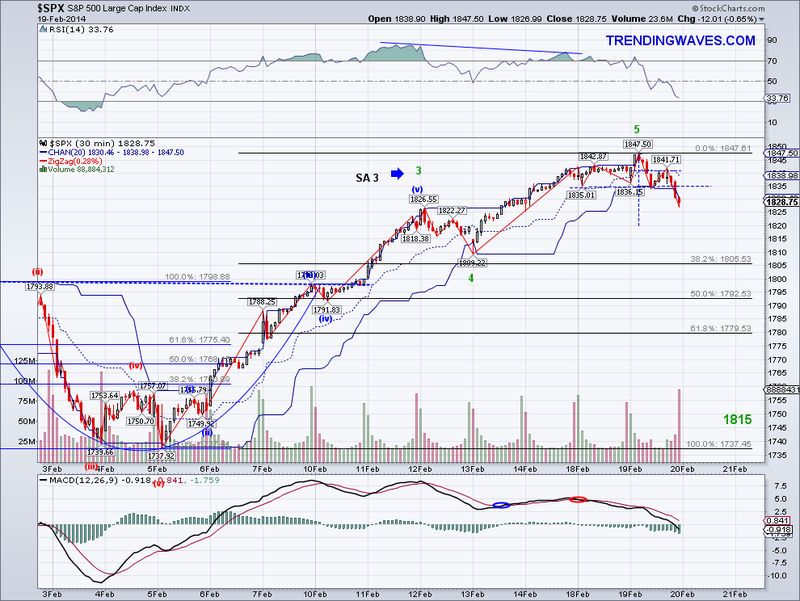 The market put in a lower low as expected and we could have the bearish 5th wave completed at 1737. Which is a bit short of the target I posted yesterday (1732) and still somewhat far from the 200 DMA level at 1709. The ISM report came in stronger than expected so there isn't really much of an excuse to sell, I think we'll know for sure in the next couple of session if we have a temporary bottom. Assuming the low today is the end of the bearish 5 wave count, the market should be working on a counter rally and an important area to keep an eye on is 1768-1772 which is about a 50% fib retracement and where the Trend Average currently is. However, the micro count on the wave from 1737 to 1755 could be part of a 5 count and if that's the case, I have 1785 as the target. 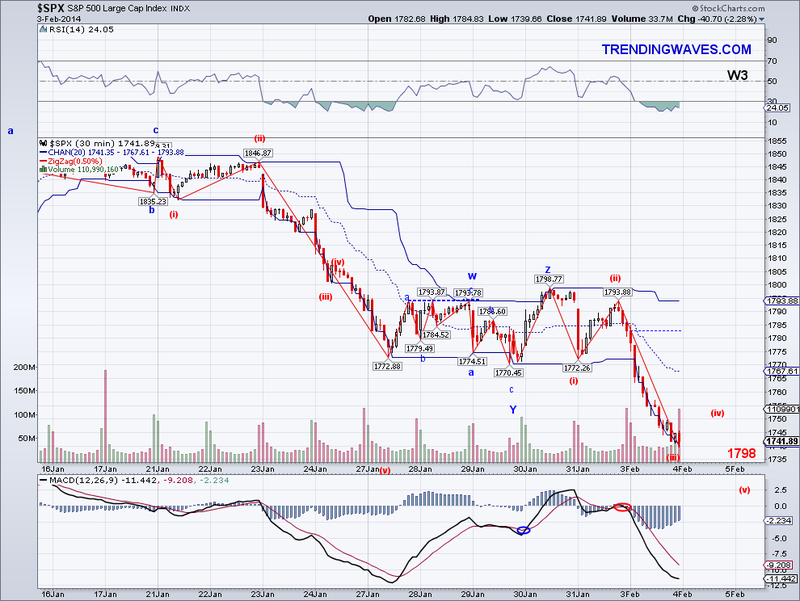 I ended up buying XIV (a lot lower than what I sold it just 2 days ago) and I will have my stop on this trade at 1737. I'll probably get VXX at resistance but it all depends on how the market handles these levels. Fundamentally speaking, the market has what it needs to mount a strong rally as the data today reinforces the underlying strength of the economy. But I am sure there will be another excuse to sell eventually. We'll see if I am right on this in the next few weeks. If the market does find a bottom around that level, it will mean we will see a last multi-month rally before a much bigger correction. If there was any doubt the market had entered into a bigger correction in the past few weeks it was made clear today. The market basically plummeted once key support was lost as many traders had been focusing on it and now it looks like the next stop might be the 200 Day Moving Average. If the market does a Zig Zag where C=A, then we're looking at 1718 as the ideal target area but given the fact the 200 DMA is at 1707 and rising, I would say there is a good chance buyers won't step in until that trendline is tested. What happens from there is obviously too early to tell but going by my Long Term count from last year (I am posting the version originally posted on May 2013), a double ZZ would be perfect in correcting the market and creating enough of a base for a rally to SP2000. The area I like for this correction to end would be in the 1575-1640 level, with the latter being my stronger preference given several support layers in that zone. But before we get ahead of ourselves, we have to see how the 200 DMA holds as we can only plan for lower levels once the 200 DMA is lost. Unfortunately I couldn't get out of my XIV position on a bounce but I got out as soon as support was lost, so now I'm 14/16 for the year and still ahead but not as much as I was a few days ago. 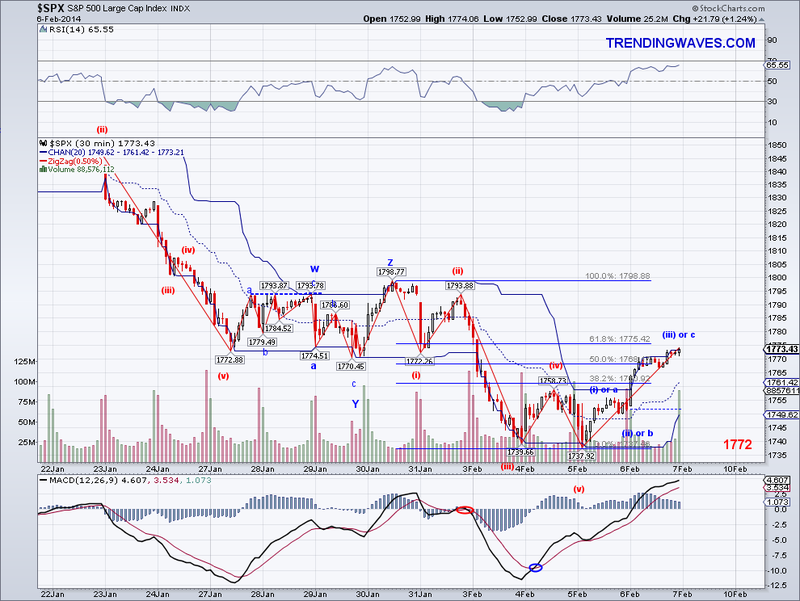 I was really hoping for the market to test upper resistance to short but that doesn't look too probable right now. So I will consider trading the bounce only if we see the 200 DMA or short on Trend Average test, until then I am just going to be an spectator.